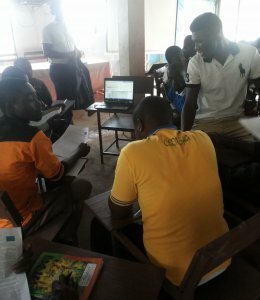 Climate Interactive has run several World Climate Simulation train-the-trainer events on the African continent this year, with two in Ghana so far. As soon as we launched the registration in July for the events in Accra, we received more than a hundred applications for each session! The interest for World Climate was high going into the event and we were delighted to then have a packed room of 50 people for each event. Our two events went very well thanks to our hosts Kenneth Nanna Amoateng (Abibiman Foundation) and Dr. Allison Hughes (University of Ghana). Coming back into our office and opening our mailboxes, we had the pleasure of seeing dozens of messages from attendees, and others that just heard about the events, who were extremely motivated to run their own World Climate simulation events. Kwame soon started to plan his first event which happened this month on September 7th at the Kumasi Institute of Tropical Agriculture (KITA). “The event was very interactive and it lasted for 7 hours beginning from 09:30 to 16:30. It was organised for a group of young and adult farmers who were receiving a short training in poultry and livestock farming at KITA. Their training was scheduled to end on Friday, 9th September, 2016 and therefore all of them wanted to take part in the event before going to their various communities which are far from KITA campus. Everybody was highly motivated to take part in this event. As a result, it was difficult to exclude any of them from the event and I have to relocate the event from the school library to the assembly hall. This resulted in an exponential increase in the expected number of participants from 40 to 61. I want everyone to participate in this climate change simulation to reduce CO2 emissions. I feel that, if we do not wake up from our sleep, climate change will destroy the world in some years to come. What surprises me is that, most of climate change is caused by human activity. The whole world coming together to solve the problem of climate change depicts togetherness. [It was] amazing, because it brought to me the understanding of how to discuss climate change to my peer and family. Yes, it has even motivated me to stick to organic method of farming than to stick to inorganic method of farming (slash and burn) which increases CO2 into the atmosphere. Participating in the game gave me a sense of urgency to engage activities that would help mitigate the negative effects of climate change. Kwame: “Personally, I am very excited with the feedbacks from participants and feel motivated to organise further simulation events”. Kwame is planning another World Climate simulation at the Global Ecovillage Network Africa Conference this December. To send Kwame your best wishes, please visit: https://groups.google.com/forum/#!forum/world-climate-community and look for the discussion “coming events in Africa”. More on World Climate in Ghana on our blog here.